Winco PF-8 Plastic Funnel, 8 oz. Take some of the mess and hassle out of kitchen work with the Winco PF-8 Plastic Funnel, 8 oz. 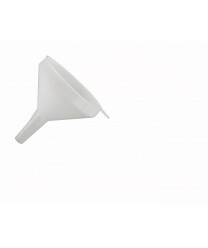 This handy funnel does a stellar job transferring liquid or dry ingredients from larger to smaller containers. Durable enough for heavy-duty commercial food prep, this white plastic funnel is great for refilling squeeze-type condiment bottles, glass spice shakers and other small-sized tabletop containers. Winco PF-32 Plastic Funnel, 32 oz. Winco PF-16 Plastic Funnel, 16 oz. Winco SF-6 Stainless Steel Wide Mouth Funnel, 5-3/4"